I'm an Annapolis-based food historian and foodways consultant. I offer PowerPoint presentations followed by tastings to organizations in the Baltimore, Annapolis, DC and Northern Virginia region on a variety of different food history topics. Follow my blog for fun food history information and lists, photos, and lots of historic recipes! Visit my website www.atasteofhistory.net to check out my programs. Also, like my Facebook page, A Taste of History with Joyce White. 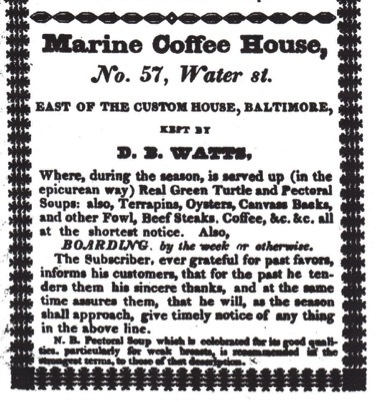 Turtles have historically been a very important part of the American diet in the 18th-19th centuries. Most species of turtle are edible but the one that was most highly prized and therefore most popular in and around the waters of the Chesapeake Bay was terrapin. 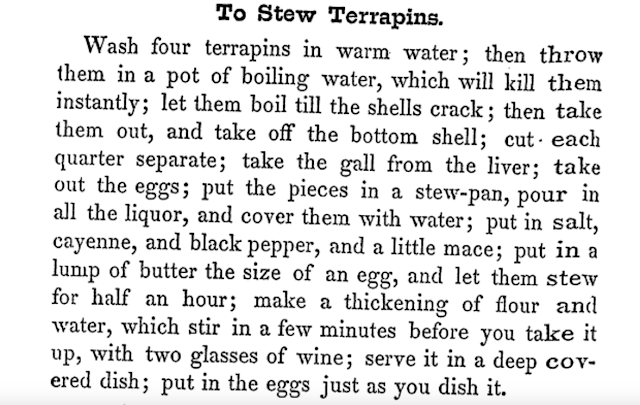 Terrapin is a small edible turtle found along the coastal marshes of the eastern US. 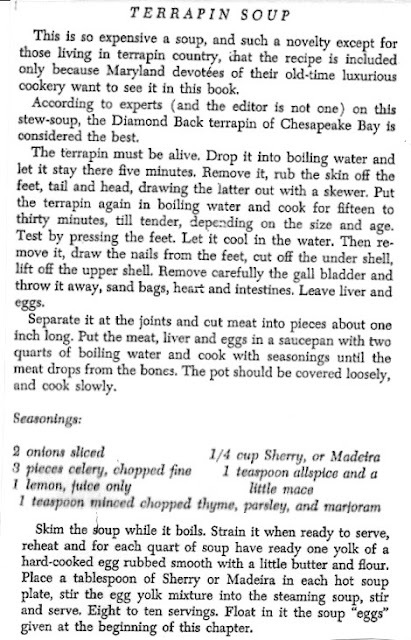 It was an important part of the diet for people living along the estuary of the Chesapeake Bay in Maryland going back to the early days of settlement, and even further back to the Native America Indians who inhabited the region. 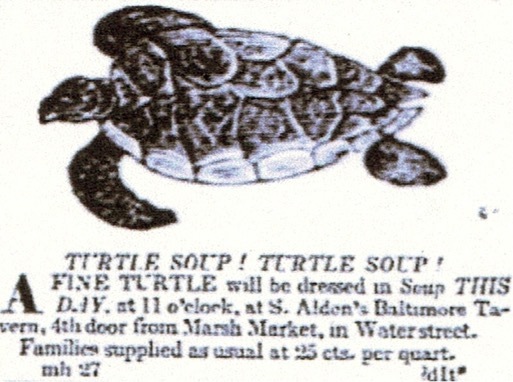 According to documentation found in the America Eats project (a project funded by the Works Progress Administration during the Great Depression to record American culture among other things), slave indentures in Maryland bore the stipulation that terrapin should not be fed to the slaves more often than twice per week on the grounds that it was so easily obtainable that slave owners would deprive their slaves of other types of flesh meat to save money. 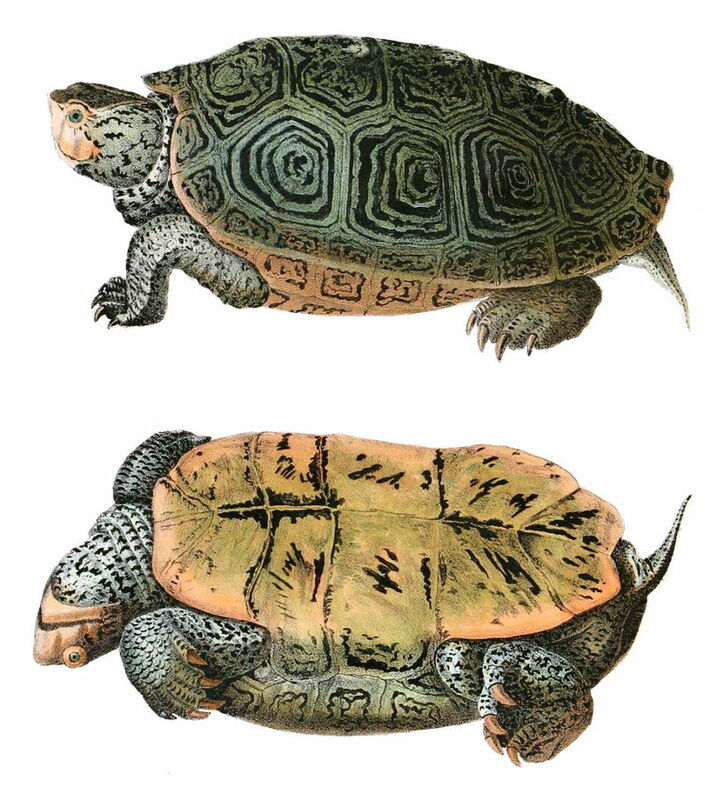 Not surprisingly, based on easy access and its general popularity, the terrapin population was drastically reduced by the end of the 19th century. Nowadays, legislation protects the terrapin from further decimation. Prior to the days when legislation curtailed the harvesting of turtles, they could have been roasted whole in hot coals; however, the preferred way of serving them was to make them into a rich soup. Historic cookbooks in the Chesapeake region and beyond contain many variations for making these types of thick, rich soups. 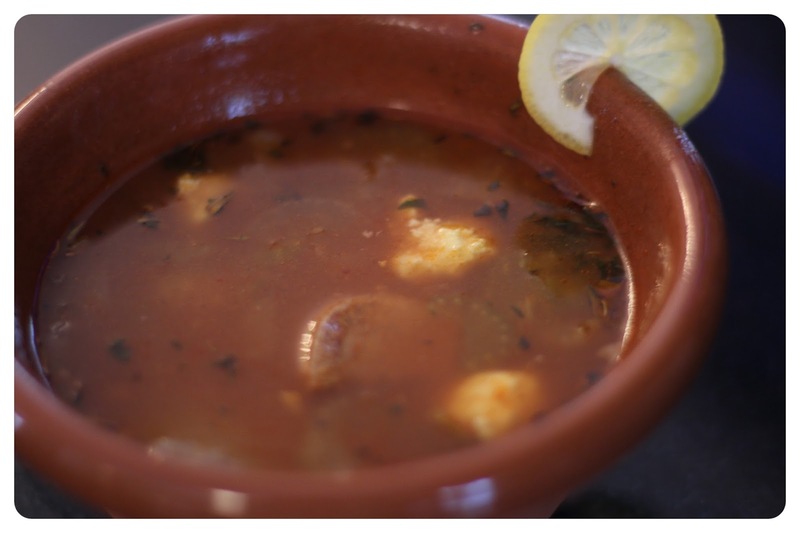 Forcemeat balls made from turtle meat or veal that can be floated in the soup. Use vegetable such as celery, carrots, turnips, etc. Sherry or Madeira, or another wine to add, usually, just before service. 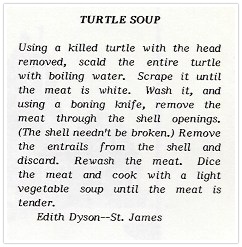 Nevertheless, blasphemous cream-based recipes for turtle soup can be found in Helen Avalynne Tawes iconic 1964 cookbook, My Favorite Maryland Recipes and another from Maryland's Way, The Hammond-Harwood House Cook Book from 1963. Notice the mention of Pectoral Soup at the very bottom! 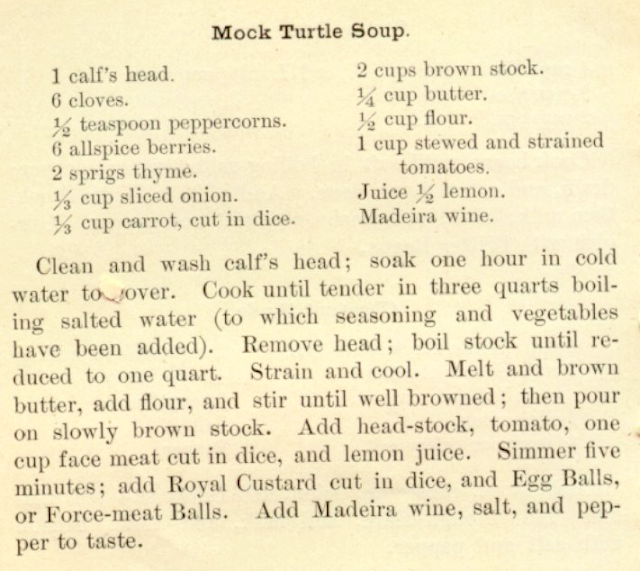 Mock Turtle Soup: Tongue and Cheek Cookery, Literally and Figuaratively! 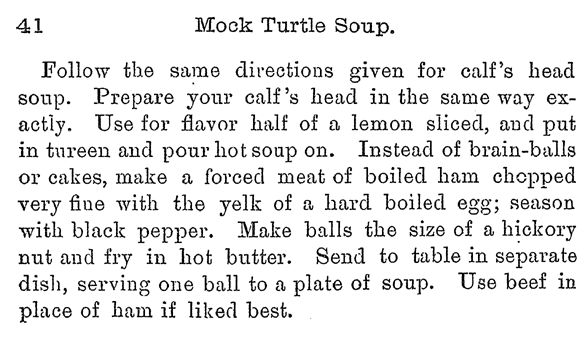 I've taken the phrase “tongue in cheek” which refers to not taking things seriously (hence "mock") and re-worked it to "tongue and cheek" to relate to using tongue and cheek meat to mimic the flavor of the turtle soup with an imposter, a calf's head. The meat extracted from the tongue and the cheeks, along with the collagen-rich stock made from the rest of the head gives this soup its rich flavor reminiscent of turtle. 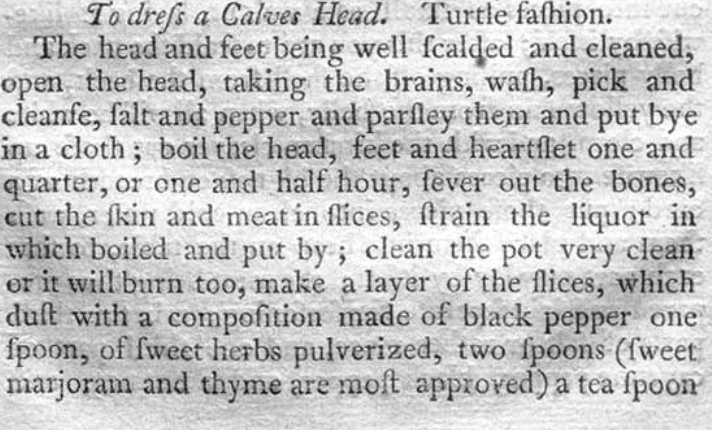 Boil a Calf's Head; Discard the brain. 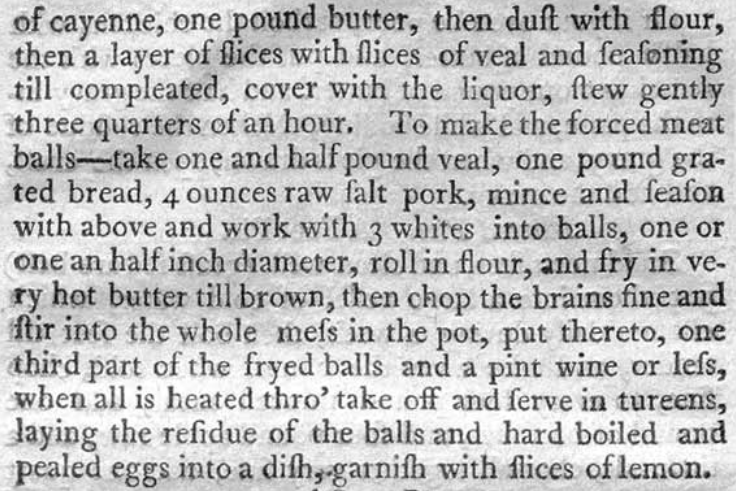 Chop the face meat and tongue, or use the meat to make forcemeat balls to float in the soup. 1 Calf's Head, Halved or Cut in Thirds (mine came from Marcho Farm, an organic farm in Pennsylvania that prides itself on the ethical treatment of its animals) Make sure the brain and eyeballs are removed prior to cooking. Place the calves head in a very large stock pot (24 quart size) and cover it with cold water. Add the vinegar and salt. Place on the stovetop and heat uncovered until boiling. Reduce the heat to medium-low, cover, and simmer. Simmer for about 2 1/2 hours until the meat starts to fall off the bones. Remember: You will need to check on the stock while it is simmering and remove the large amounts of scum that will float to the top. If you do not remove the scum, the stock will taste harsh and bitter. Into a large storage container, drain the stock through a fine mesh sieve to remove excess scum and and bones or other detritus from the cooking process. Pick off the meat from the cheeks and any other parts of the head you like. Peel the skin off of the tongue and chop into bite-sized cubes. Place all of the meat into the stock. 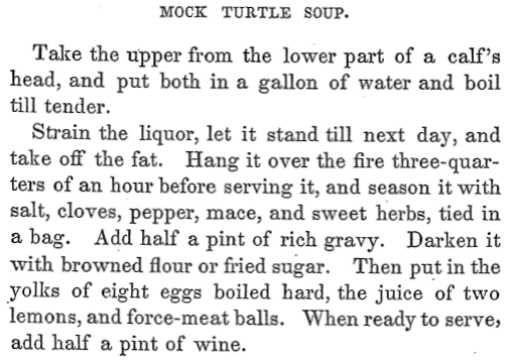 You can use this stock immediately to complete the recipe for Mock Turtle Soup or you can freeze it for later use. Heat the oven to 400º F.
Line 1-2 large jelly roll pans or roasting trays with parchment paper and grease. In a large bowl, mix together the breadcrumbs, eggs and water. Add the seasonings and herbs. Mix until evenly distributed. Add the ground veal and mix together gently using a spatula or wooden spoon. Rolls the meat mixture into small balls measuring 1/2 ounce each. Line them up on the pan. Yields about 170 mini meatballs. In a medium bowl, mash the yolks of the eggs. Add the uncooked egg whites to the mashed cooked egg yolks and mix until all the evenly blended. Refrigerate the egg mixture until it is completely cool. Form the egg yolk mixture into small balls (whatever size you choose). Drop 2-3 balls at a time into boiling water and cook until the balls harden and rise to the surface of the water, at least 2-3 minutes. Melt the butter in a large pot (16 quart size). Add the chopped onions and salt & pepper. Cook on medium heat until the onions are slightly softened and glistening (about 7-8 minute). Sprinkle the flour over the onions and cook for 2-3 more minutes, or until the flour is cooked. Remove from the heat and add the remaining vegetables, herbs, lemon zest and juice, tomato paste, Madeira, and salt and pepper. Mix. Pour in the calf's head stock. Place over medium-high heat and bring to a boil. Then, reduce heat to low, cover, and simmer until the vegetables are tender. 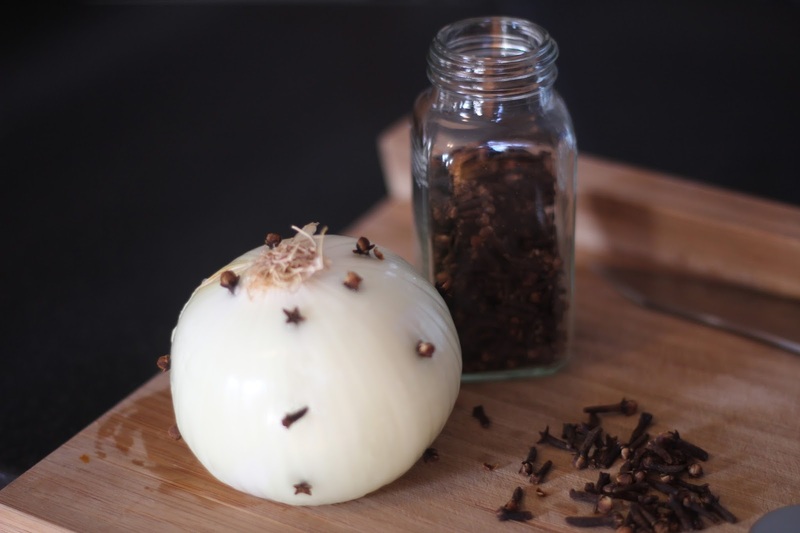 Once the vegetables are tender, remove the bouquet garni and the clove-studded onion (discard). Just before service add the forcemeat balls and egg dumplings and heat. Garnish soup bowls with sherry and lemon slices, optional. Shrewsbury Cakes: The Best Way to Use Caraway!